Heat oven to 425°F. Line 15x10x1-inch pan with cooking parchment paper; spray with cooking spray. In medium bowl, mix cauliflower and wing sauce until coated. 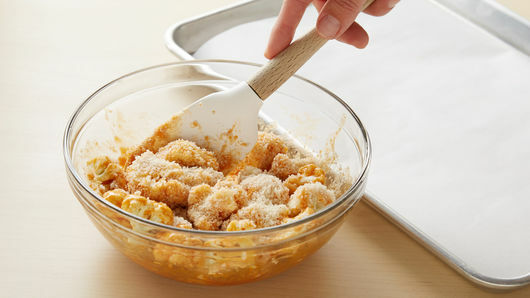 Add bread crumbs; toss to mix well. Spread in single layer in pan. Bake about 20 minutes or until golden brown and cauliflower is fork-tender. Spray large cookie sheet with cooking spray. Unroll dough on cookie sheet. Bake about 8 minutes or until crust just begins to brown. In small bowl, stir Alfredo sauce with 1/3 cup of the blue cheese. Spread mixture evenly over crust to edges. Sprinkle with 3/4 cup of the mozzarella cheese. 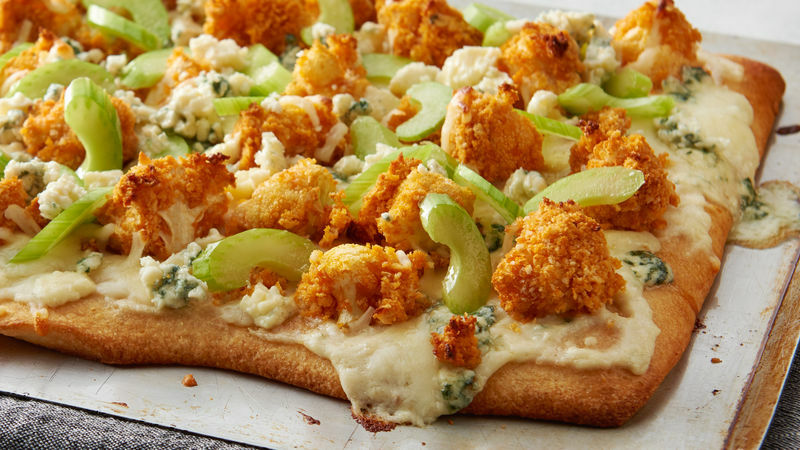 Top with roasted cauliflower; sprinkle with remaining 3/4 cup mozzarella cheese and 1/3 cup of the blue cheese. Bake 8 to 10 minutes or until edges are golden brown. Cut into 8 rectangles. To serve, top with celery and remaining 1/3 cup blue cheese. In the 1950s and early 1960s my mother made chicken wings brushed in lemon-butter. In the mid 1960s, I began cooking as a girl scout to earn my cooking badge, and a few years later in my junior high school home economics class, we used Pillsbury™ doughs in many dishes from appetizers to desserts. Also in the mid 1960s, Buffalo wings and hot pepper sauces emerged. I loved the new peppery, sauced wings, and they became a family and party favorite. My mother made a delicious homemade blue cheese dressing to complement the hot and tangy flavor of the wings, and sliced up celery sticks to cool down the dish while also garnishing the party platter. When the platter was nearly bare, I would mop up the remnants of wing sauce and blue cheese dressing with a piece of crusty bread. 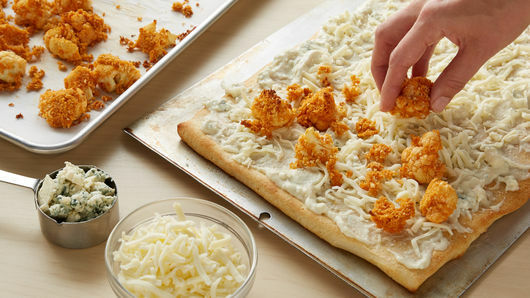 Today, when cauliflower has become a widely versatile substitute ingredient in many recipes, I was inspired to create a pizza that combines elements of the Buffalo wings my family loves with mom’s memorable blue cheese turned into a white pizza sauce. I replaced the chicken with cauliflower and baked it all on Pillsbury™ refrigerated classic pizza crust. It gets garnished with a fresh and cool crunch of sliced celery on top. This is a timeless recipe, with a current variation on a popular theme, reflecting decades of family food memories.